Hello! Welcome to the Xweetox Forest! This is a directory dedicated to Xweetoks everywhere! My name is Soumie, and I keep watch over the forest with my friend Esurynti. We're here to make sure every Xweetok can find their own place here. 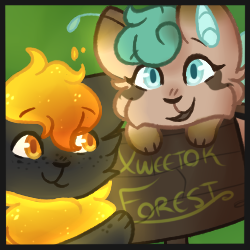 Xweetok Forest was founded on 5.18.16, and plans to be around for as long as possible! 03/7/18 Xweetok Forest revamped! Xweetok of the Month, UFT/UFA section added, and a new layout! Since this is the first month we're doing it, I've made one of my Xwees Xweetok of the month as an example for how it works. Getting listed is a very simple feat: simply fill out the form and neomail it to Bee! All Xweetoks are welcome in the Xweetok Forest, and you can list as many as you'd like. Please keep in mind that unless you're listing in the UFA/UFT section, we only list permanent pets. To add a Xweetok that's UFA/UFT, use this form instead! And finally, Xweetok of the Month! This feature only has 2 criteria; 1- only submit and application if you are ok with someone drawing your pet, and 2- make sure they're listed here with us! 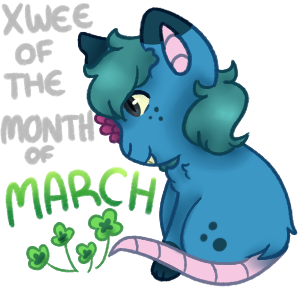 All candidates for Xweetok of the Month are kept and automatically eligible again if they don't get chosen for the month they are submitted. It's perfectly fine to nominate your Xweetok when asking for them to be added to the directory! Name/Username: Xweetok Name: Xweetok Ref: could be a character reference, or simply a request to draw your xwee with their customization, or as a regular -whatever color they are- xwee! Description: A little bit of text describing your xwee! Their personality, what they do, what they like, ect. Ryuoma is a mutant Xweetok owned by Bee! He's shy and may take a bit of time to warm up to others, but he's got a big heart and will always listen to what you have to say. He likes flowers and napping in his garden. For listed Xweetoks and Xweetok of the Month! If you would like to affiliate with Xweetok Forest, feel free to mail Bee to make a request. Layout by Silent Serenity. Neomail button from Bejewelled. Background pattern from lolwat. Other graphics and edits by Bee.